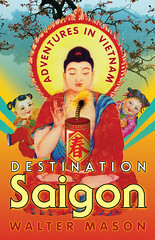 The official launch of Destination Saigon, by Walter Mason was held tonight at the Unitarian Church, East Sydney. It completed exceeded all our expections, around 120 packed into the venue to hear Maggie Hamilton official launch Destination Saigon and to hear Walter describe his experience and excitement in writing the book. all the best with your round of publicity...the book seems to be everywhere!